While the whole world has been in panic mode about the “Ebola Crisis” that has been evolving in western Africa in the past few months, a new problem has started to raise its head now. As we seem to have achieved some sort of control over the epidemic of panic and ebola, the media has dished out its next offering for us: The “Black Death” disease is raising its head in Madagascar. That’s right folks, you got me right. Madagascar is facing an outbreak of plague and it does not look good. The fact is, there have been continuous outbreaks of the disease in this nation every year for the past several years. Although I do not have access to the statistics at the heart of this graph, and I must admit that I am not extremely well-versed in the minute details of the epidemiology of infectious diseases in this particular nation, an online search seems to reveal that there has been annual outbreaks for a while now. 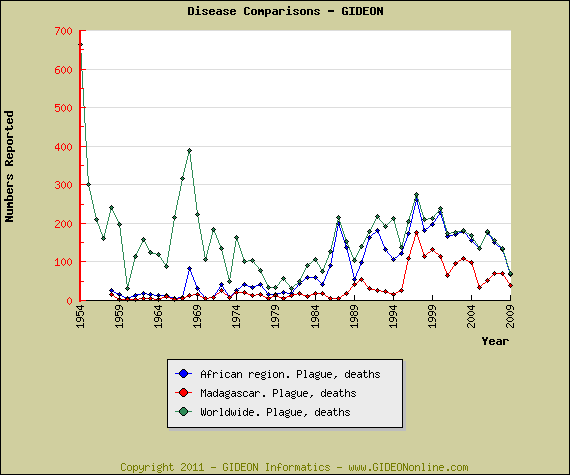 If the Global Infectious Disease and Epidemiology Network (GIDEON, for short) is to be believed, then the plague has been around in Madagascar for a while now. 1991 – An outbreak was reported in Majunga. 1995 – An outbreak (108 confirmed and presumed cases) was reported in Mahajanga city. 1997 – An outbreak (2,863 cases, 176 fatal) was reported. 1998 – An outbreak was reported in a hamlet in the Ikongo district. 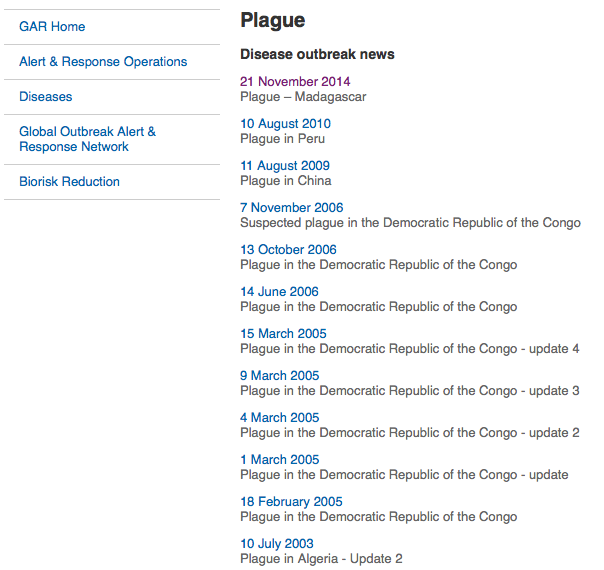 2008 – An outbreak (7 deaths) of pneumonic plague was reported in Toamasina. 2010 – An outbreak (31 cases, 1 fatal) was reported in La Libertad. 2011 – Outbreaks (200 cases, 60 fatal) were reported, including Antananarivo (3 fatal cases) and Antsiranana (16 fatal cases). 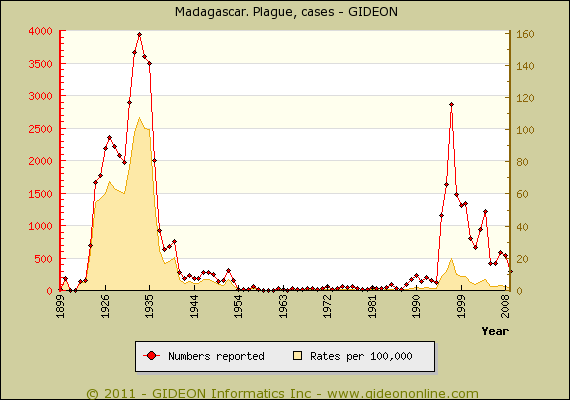 If there is one thing these numbers suggest, then it is this: plague has been a problem in Madagascar for a while now. While the whole world, and the media, in particular, is more sensitised to the issues of infectious diseases spreading through the world like wild fire, the numbers are no worse (till now) than it was three years ago. This year it seems like there have been 119 diagnosed cases with 40 deaths, which are similar to the numbers seen in the 2011 outbreaks. This is a clear indicator that there has been a systematic ignoring of the issue at hand. While I appreciate that the island nation is battling political instability, poverty, hunger, and a long-standing problem with locust infestation that causes massive destruction of crops each year, adding to the burden of hunger, the international aid and attention that Madagascar will receive this year, is surely going to trump any such activity in the past. This tendency to ignore a problem (there is a reason a bunch of diseases came to be called as “Neglected Tropical Diseases”) until it grows to be a menace to the developed world seems just a wee bit morally repugnant to me. 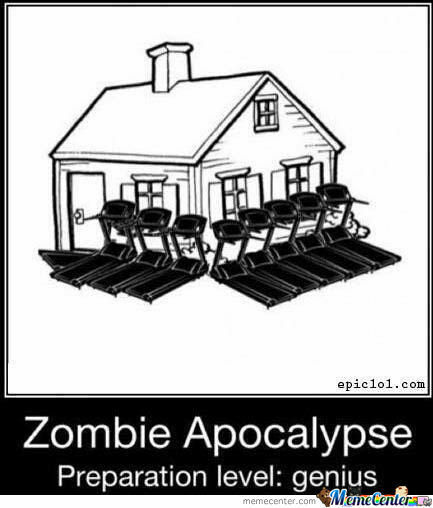 Thank you MemeCenter for saving my life! Tags: black death, epidemic, infections, madagascar, outbreaks, plague, reemerging infectious diseases. Bookmark the permalink.